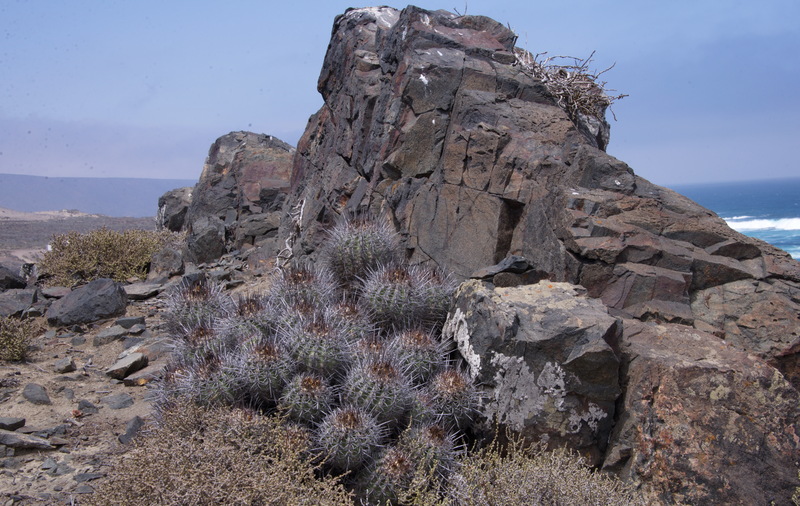 Tuesday’s visit to Bahia Teniente, the location for the southernmost Copiapoa habitat, left me curious, as we did not find the plants in question – just insufficient time budget I’m sure. But still. It’s not possible to access the entrance heading north on R5, but the first official exit after the hole in the fence is for El Cebada, so it was there that I made today’s first stop. One Sunday morning in 2006, Angie and I made our first attempt to get there in a Toyota Hilux. There is a gravel track that runs back south, parallel to R5 and then dips down to the bottom of a, mainly dry, riverbed. That day, a gate had been locked about three-quarters up the hill. There was not enough space to turn the car around so there was nothing for it but to reverse back up. Should have been easy, except the handbrake did not hold and the wheels spun on the gravel. I had to hold the car on the footbrake while Angie locked the 4×4 in place on the front wheel hubs. 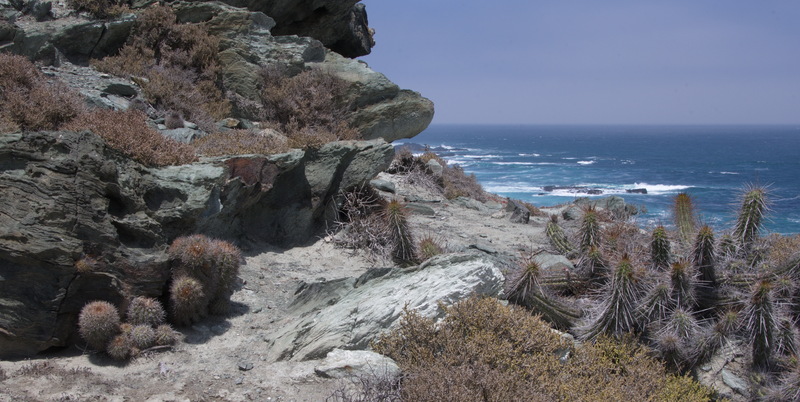 I could see some Eulychnia castanea on top of the low dunes, a mixture of black rock outcrops like we had seen at Bahia Teniente, just across the ‘river’, and ‘talcon powder sand dunes’. I decided to climb the rocks to a nice vantage point overlooking the beach, great for some scenic overview shots. 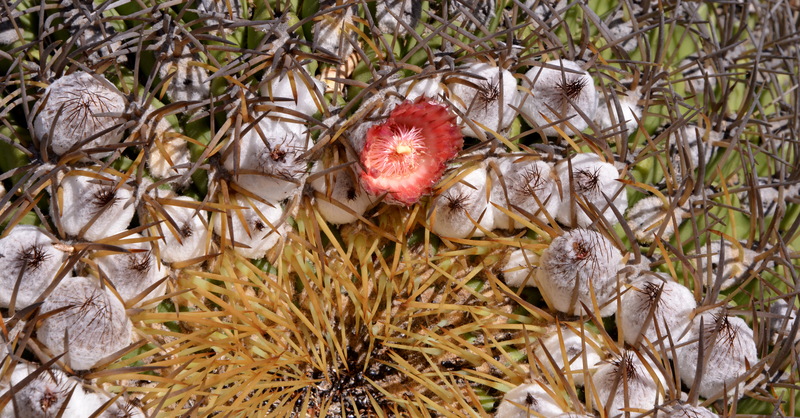 As I adjusted my position, I nearly tripped over the first globular cactus – Eriosyce subgibbosa, the same species seen at Bahia Teniente yesterday. Switching the camera to ‘cactus mode’, I soon found a lot more, but there were some that looked ‘different’, with a more felted apex: Copiapoa coquimbana. Farther along there were more, some in flower, confirming the ID. They were very photogenic, growing on the dark rock with the off-white beach in the background and the Ocean waves rolling in. It seemed when I looked at the car that the water in the river had risen very slightly in the hour that I had been playing in the sand, so perhaps this was another tidal river, similar to the one that caught us out in 2001, at Carrizal Bajo. Best to move the car. I caused a minor landslide as I took the short way down a sand dune and got safely back on R5 a few minutes later. After a quick lunch at the Copec at Socos, there was plenty of time for another look at the Fray Jorge track. It was bright and sunny, so ideal to take another look at the spot where in less favourable conditions Jonathan made his first Chilean cactus stop early in November to see Eriosyce aurata, with the promise of more to come that I failed to keep later in the trip, due to the car problems with Nessy 1. It’s always good to have some unfinished business as an excuse to come back another time. I wanted some more images of the agricultural developments along the track for a ‘now and then’ comparison in a future talk and so I made two stops (S2957 & S2958)along the track, found some E. aurata – but only a dozen at most, some in flower, and captured the rolling fields of grain that have now replaced the desert. The grain is planted so far apart that it is easy to see the soil between the stalks. To my untrained eyes, it seemed good fertile soil – the limiting factor as always in this area is lack of moisture. My worry would be that with a drying wind blowing continuously, that once the endeavour has failed, the topsoil will blow away and the erosion will cause a barren desert. Plan B seems already in progress as the bases of more wind turbines are already delivered. I’ll come back here again in the next few days to drive down the track to the Ocean at Caleta El Sauce.